Ortigia, our island home in Sicily for two months each winter, is filled with unexpected treats. Sitting in the cafe in Piazza Duomo, I saw a bride and groom send balloons, confetti and doves into the air in celebration of their marriage. In front of the Chiesa Ste. Lucia, a puppeteer entertained a crowd, including a curious dog, with a marionette that sang like Frank Sinatra. There are courtyards filled with flowers, ornate iron balconies and pastel motor scooters waiting to be discovered in the narrow lanes. The most unpredictable treats for me have been the friendships we have formed with fellow travelers and the meals we have shared with them. No need to worry - Soe is in charge. We met Michelle and her husband Burmese husband, Soe, at the Cafe Minerva. I invited them to sit with us and in less time that it takes to figure out how many c’s there are in cappuccino, Soe and I were talking about food. 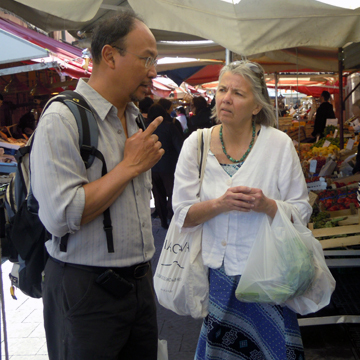 We finished our coffees and decided to walk to the market together.Michelle and Charles walked together and talked about the challenges of speaking Italian and as I shopped, Soe talked about what he would cook if he had a kitchen in Ortigia. I had a kitchen. He had a menu in mind. We decided to have dinner together. It would be a Burmese dinner with shrimp, orange salad and green beans and Soe would be in charge. When Soe and Michelle arrived, he began by trimming and slicing. He cooked like a classically trained French chef. I tried to stay out of his way as I watched him assemble a tray of ingredients for each dish. I cut the peel and pith from six blood oranges, cut each orange into eight pieces and put the pieces into a shallow bowl. 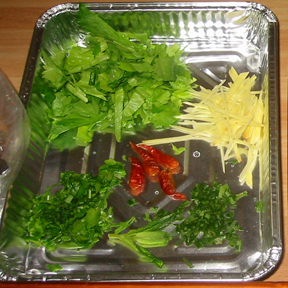 In Burma, this salad would be flavored with fish sauce and kaffir lime leaves. Instead of fish sauce, we used a tablespoon of chopped salted anchovy that had been rinsed and soaked in cold water for ten minutes and then drained. Instead of kaffir lime leaves, we used a tender leaf from a branch of oranges. I stirred in the anchovy and finely minced orange leaf, Soe added a couple of teaspoons of fresh mint leaves, half a small red onion that had been thinly sliced, and poured on three tablespoons of extra virgin olive oil. A quick toss and it was ready and we moved on to the green beans. 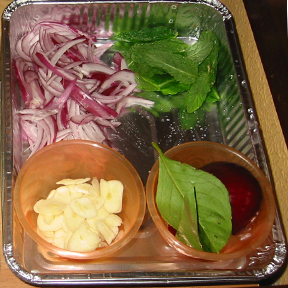 Download and print orange onion salad recipe with an ingredients list here. I blanched the green beans in a large pot of rapidly boiling salt water until they were barely tender, shocked them with cold water and drained them. 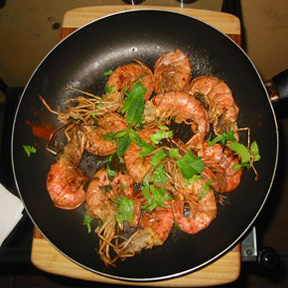 Soe sauteed the shrimp heads in a tablespoon of olive oil in a large frying pan over medium heat. After they had cooked for three minutes, he lowered the heat, added a tablespoon of sweet paprika and two tablespoons of white wine and continued cooking it for two more minutes. He poured the mixture into a strainer and used a spoon to force the liquid into a small bowl. He wiped out the pan with a paper towel, put a tablespoon of oil into it and when the oil was hot he added two cloves of thinly sliced garlic and half of a thinly sliced red onion. When the garlic and onion were cooked, he added the pre-cooked green beans, stirred in the paprika-wine sauce and cooked the mixture until the beans were hot and covered with the sauce. 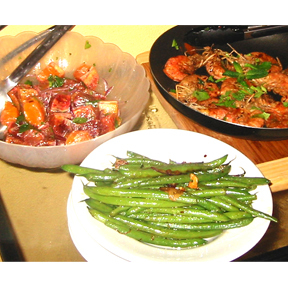 Download and print spicy green bean recipe with an ingredients list here. It was time to cook the shrimp. Soe had bought a kilo, about two pounds, of large, nearly five inches long, whole shrimp at the market. He cleaned them by removing the heads, splitting the shell with scissors in order to removing the dark vein but he did not remove the shells from the shrimp. And then, he turned into a Burmese whirlwind. I couldn’t keep up. I know he used a large, frying pan to stir-fry thinly sliced red onion, garlic, fresh ginger and a few small, dried hot peppers. I think he added a splash of white wine after he added the shrimp. It seemed as if the shrimp were cooked in less than three minutes. To finish them, he turned off the heat, added a tablespoon of water, (a Burmese technique to keep the shrimp from overcooking and becoming rubbery, he said), added a generous handful of tender celery leaves and there may have been some fresh basil in the mix. Perhaps some mint, maybe orange leaf, I don’t know – I lost track of what he was doing. Dinner was amazing, the food was perfect, the conversation non-stop. It was unimaginable serendipity. After Soe and Michelle had gone back to their hotel, I tried to remember how he had cooked the shrimp, I tried Googling Burmese Shrimp but couldn’t find anything that resembled what he had cooked. I’ll have to invite them to come to Vermont and ask Soe for another cooking lesson. Even though I can’t tell you how he made the shrimp, I promise that the orange salad recipe works and I hope you will try it. Don’t worry if you don’t have a fresh citrus leaf you can use the zest from one orange instead. Looking forward to your upcoming posts!! I mean this with all sincerity, you should write a book. I sooo enjoyed reading about this Burmese cooking adventure. The fact you friended someone and had them cook in your home is the beauty that life should be about. That’s the plan…….It’s just taking some time. It was such an amazingly fun night! 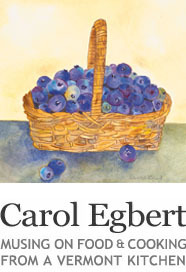 Thanks again, Carol and Charles—such wonderful and kind hosts! Absolutely, Our PLEASURE. Thanks to Soe! This looks and sounds amazing! Thank you for posting this! This sounds so typical with all the sicilian foods. I will definitely be trying this….maybe this weekend? we shall see.